One of the thousands of apps for the iPhone is “Ambiance.” It provides lots of sounds; ones that are soothing and help one fall asleep. Does this have anything to do with public policy? Yes. Because as we think about urban mass transit, most of us think of either the grittified sound of screeching wheels on the New York subway or the sleek (though not always safe) movement of the Metro in Washington DC, or BART in the San Francisco bay area. The latter is what we’d like in St. Louis; a gleaming train running down the middle of Highway 40 or an express train from O’Fallon, MO to O’Fallon, IL. Well, guess what: it’s not going to happen. We’re not a megalopolis like New York, Chicago, or Toronto. We’re a very livable mid-sized community that has less traffic than the Atlantas or Houstons of the world but still enough to aggravate us considerably. A recent article in The St. Louis Beacon by Harry Levins tells us what we’ll get once we (hopefully) pass a half-cent sales tax increase for Metro on April 6. About half of what we’ll get is restoration of what we lost last summer when voters cut back on Metro funding, and the other half will lead to system improvements and the beginnings of expansion. Check out the article for informative maps of proposed new routes. The administration of Metro has not always been sound and wise, and literally millions of dollars have been frittered away. But Metro is now under new management with a more clear and realistic vision of what we can expect in the future. Key to the plans is inclusion of real express bus routes. This is smart, because the cost of building the bus lines is half the cost of the rail line and takes half as much time to plan. Fundamental to this strategy is the reality, however distressing, that St. Louis is a city of concrete and asphalt roads rather than steel rails. 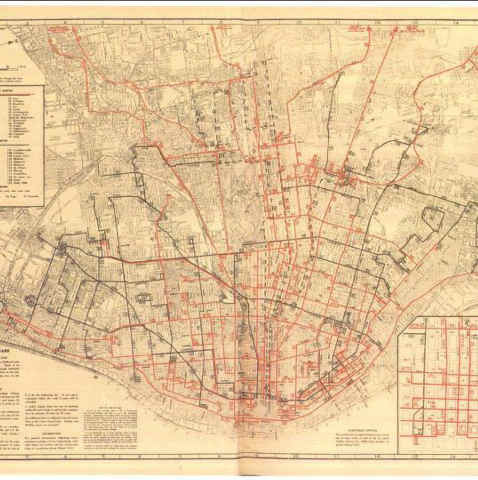 The marvelous streetcar system that we had prior to World War II ended with the last run of the Hodiamont line on May 21, 1966. Those particular tracks were replaced with an asphalt alley, which now is the surface of one of St. Louis’ most rapid bus routes. So as we approach the April 6 vote, let’s remember that the leaders of Metro are thinking in terms of a system that will work for St. Louis as it is; not as we sometimes would like it to be. Hopefully, in 50 or 100 years we’ll have a yet-to-be-invented transportation system that will make both buses and subways obsolete. But we’re not there yet. We can get limited satisfaction now by riding the 50 or so miles of Metro or listening to rail sounds on an iPhone, but if you want new transit in St. Louis that is mass, think of the soft purring of a clean and efficient bus engine. Previous Post:My download speed is 5129 kbps. What’s yours?